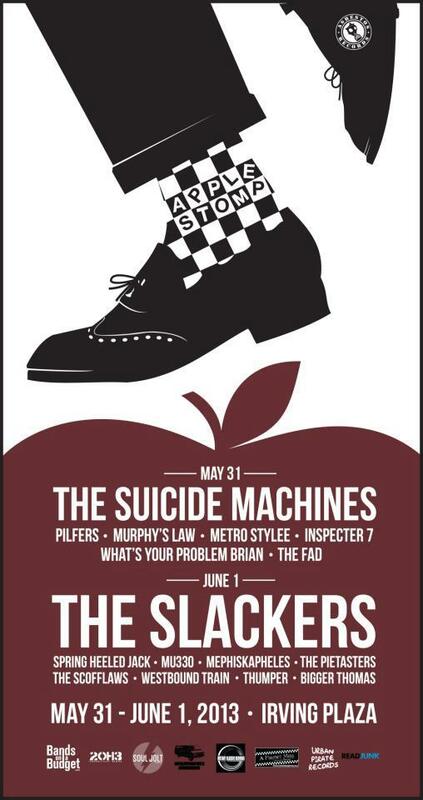 Try as we may, we couldn’t go without mentioning The Apple Stomp, a two-day ska festival at Irving Plaza in New York City. The bill boasts a handful of the strongest current touring ska acts, but the real treat is the reunion of many defunct acts from the late 90s. Personally, I’m excited to see the bands I’ve never seen or haven’t seen in over 10 years. I expect it will be well worth the train or bus ride. Tickets range from $41 for one night to $69 for two nights, but it looks like the two-day passes are almost sold out. UPDATE 5/30/13: Can’t make it to NYC? SuperSka is playing two sets at Sally O’Brien’s in Somerville Friday night. No Cover. Slightly more info on Facebook. For updates, like The Apple Stomp on Facebook, join the Facebook event, and follow #applestomp on Twitter. In related news, Pilfers recently posted a new song called “Easy Man” which they’ve been performing live. If you’re not already familiar, the folks at Asbestos Records are also purveyors of new and old ska. Check out their store in Big Cartel, in particular the Ska Is Dead 7inch series which includes the aforementioned Pilfers tune. Pingback: Brooklyn Rocksteady Documentary: A Story About My Scene | Jacob Wake Up!